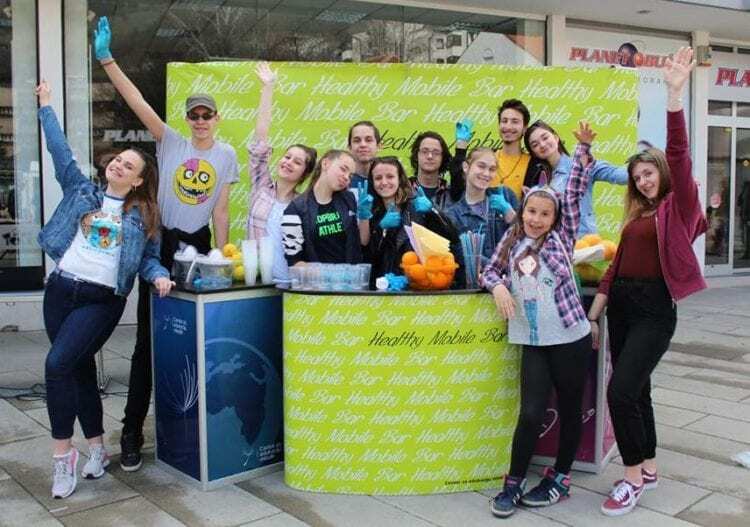 IOGT International member, CEM – Center for Youth Education, celebrated the World Health Day with their well-known action Healthy Mobile Bar, in partnership with the Public Health Institute. In Travnik, Bosnia and Herzegovina CEM volunteers, as usual, prepared an open-air party for their fellow citizens, with music and fruit cocktails, all free from alcohol, promoting a healthy lifestyle. The World Health Day was marked on the central city square in Travnik, organized by the Public Health Institute, in cooperation with the Sports Federation, Pharmamed Travnik, and JU Bonica for Pulmonary Diseases and TB, the Croatian Hospital “Dr. Fr Mato Nikolić “and the Center for Mental Health. World Health Day is celebrated all around the world, every year on April 7, under the patronage of the World Health Organization to raise awareness about important health topics. This significant date was an opportunity to highlight the problem of alcohol consumption among children and youth in BiH, and its easy access, low prices and uncontrolled promotion. CEM demonstrated that alcohol and fun has no correlation through their Healthy Mobile Bar and open-air party. Good entertainment does not depend on alcohol consumption, but from people who know how to have fun for real”, was the message from CEM as per their Website.